This second book of the Gold Seer Trilogy has a very different flavor than the first as the first was a long journey narrative. This, by contrast, is more split into two parts, the first being an account of creating their homestead and helping it to survive, and the second of being an unwilling captive in her uncle's camp and joining a resistance movement in a fight for freedom. Rather than being a book all its own, it is decidedly a second book where mostly action carries the novel rather than plot or other drives, so readers will want to read the first before they try this one. The setting is much more localized, but we don't get to see much of California until the very end when there are glimpses of a historic Sacramento. 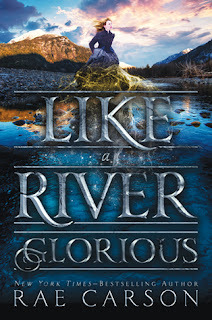 It's possible that Glory, California, their small town (which seems to be fictional), could be Glory Holy Recreation Area, a bit southeast of Sacramento since it is both near mountains, east of San Francisco, and has quite a bit of water nearby as described in the book. Our heroine Lee has also grown into her leadership role among the group, and most think highly of her judgment and abilities after their trek West. When other groups (men) begin to intermingle with their own, even these men come to recognize Lee's leadership and voice despite her gender. While Lee is captive in her uncle's camp, she must return to the pretense of being a proper young lady and subject to her uncle's authority and that of other men. Even when she is brought in by the leaders of the resistance group, Lee must still keep up much of the act to keep her friends safe. However, the very power her Uncle Hiram wants to use to save him, Lee grows to wield for her protection and as a potential weapon. Also, Lee and Jeff's romance heats up a bit, and Lee is no longer denying her feelings. Jeff is growing to appreciate his heritage, that of being half-Indian, and begins to see their rights as his own rights and speaks out among those who are not Indian. One of the things I enjoyed most about this novel was how it brought cultural issues of the area to light without being overwhelming such as: the treatment of Indians of the period (capturing them, enslaving them, stealing their land, and treating them with very little human dignity or care for life); the treatment of the Chinese where they immigrate and gain work contracts which made them no better than performing slave labor, sometimes termed a 'coolie gang'; and still continued the issues of women's rights and slavery. Another change from the first novel is the growth of Leah's gold-sensing power. Here she begins to use it more frequently, perhaps because her secret is no longer as secret, and it begins to transform. No longer is it just a calling where the gold appears from the ground, but she is able to make it mold and bend to her will with greater and greater success. Lastly, isn't that cover absolutely gorgeous? Doesn't it really capture a glorious sunrise? I still can't wait for the third and final volume Into the Bright Unknown coming out in October 2017, and I expect we will see even more of Leah come into her own, both in powers and in the world.